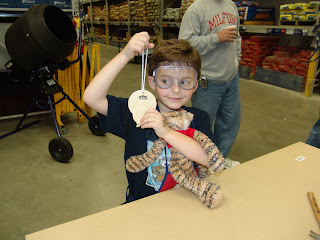 We went to Lowe's Saturday morning for the building project. We didn't know what it was before we got there. Ryan was thrilled to see that is was a spider. It was a really cute project. After we were finished ryan asked the man if he could get the fire truck that he missed when he was sick. The guy gave it to him and gave him 2 extra spiders to build at home. Ryan was so happy. He even got the fire truck patch, he was very upset when he was sick and missed it. Usually you can go and get past projects but you can't get the patch. It was a really nice day to go, there were tons of kids there. Usually when we go it is just us. We are going to continue to go a little later like this week, we are normally the first one there. 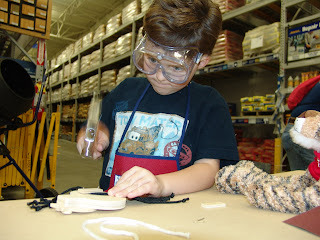 This Saturday is the Home Depot one for anyone who wants to take their kiddo. 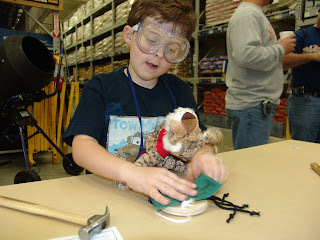 He looks sooo cute in those goggles. We went this Saturday too. Daws also made a spider, I posted pics of him. It would be cool if they went to the same Lowes and could do it together. It's so funny you said you started leaving later. I did the same thing cause we were always the firt ones at ours too so I didn't even leave until 10:00 and I still got there at 10:08! I`m so happy he got to get the project he missed.Is he going to teach the neighbor boy how to do the spider? Yeah he and Nick did one of the extra ones yesterday. It only takes me about 7 or 8 minutes to get to ours too. I love the look of concentration on his face in the hammering picture! That is such a neat idea. I wonder if our Lowe's does that? That was very nice of the man to give him extra spiders and the truck project he missed. He looks like he really enjoys himself! i think we'll try and make the home depot one on sat. thanks for the heads up! So, I know you have been making a bunch of cute things for Ryan's class Halloween party I bet so lets see pics of all the cute stuff! Let's see your carved pumpkins and costumes!